Optical coherence tomography is referred to a non-invasive imaging diagnostic test. Optical coherence tomography has emerging applications in ophthalmology, oncology, dermatology and others. It is also defined as an emerging technology for performing high-resolution cross-sectional imaging. It uses coherent light to capture micrometer-resolutions. The global optical coherence tomography market is expected to grow at a CAGR of 10.9% over the forecast period i.e. 2017-2024. 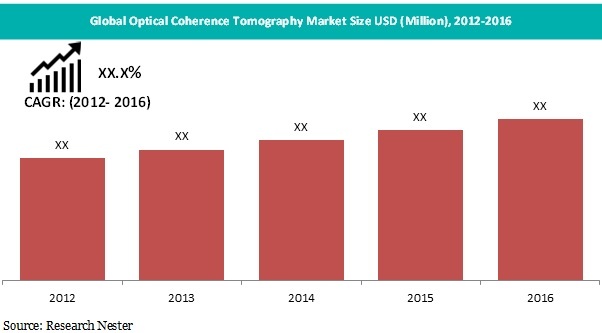 Moreover, the global optical coherence tomography market is projected to account for noteworthy sales of USD 1.8 Billion by 2024. Further, the market of optical coherence tomography market is driving on the back of numerous factors such as rising healthcare expenditure, rising prevalence of chronic diseases and favorable governmental support. The global optical coherence tomography market is segment into type, device type, application, technology, end user and region. Additionally, the application segment is further sub-segmented into ophthalmology, dermatology, oncology, cardiovascular, dentistry and cancer detection out of which ophthalmology segment accounted the largest share in 2016 in terms of revenue. Moreover, ophthalmology segment is believed to register a phenomenal CAGR by the end of 2024. Apart from this, spectral domain OCT by type is envisioned to capture largest market over the forecast period. Europe region captured the second largest market of optical coherence tomography in terms of revenue in 2016. Further, Western Europe countries such as U.K., Germany and others are believed to be the major countries witnessing the augmented demand for optical coherence tomography owing rising number of patients affected with eye disorders. Further, Asia-Pacific region is projected to be the fastest growing optical coherence tomography market by 2024 due to favorable government initiatives in various nations such as India, Japan and others to improve healthcare infrastructure. For instance, according to IBEF, in India, government has earmarked USD 5.4 billion for healthcare sector. This factor is anticipated to boost the growth of optical coherence tomography market in Asia-Pacific region. Rising incidences of diabetic retinopathy coupled with advancement in healthcare products for the effective treatment of the patients are expected to be the dynamic factor behind the rapid growth of optical coherence tomography across the globe. 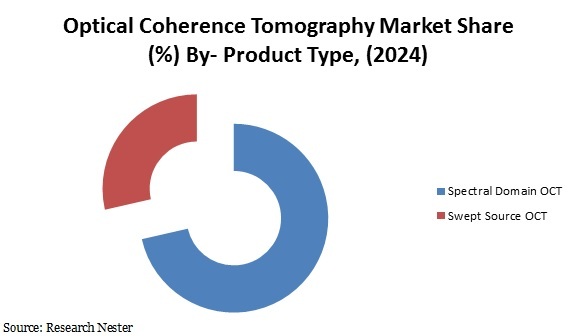 Moreover, growing adoption of innovative imaging diagnostic products for the treatment is believed to flourish the growth of optical coherence tomography market by the end of 2024. Furthermore, strengthening GDP figures along with government initiatives to develop the healthcare infrastructure in developing nations such as China, India, Malaysia and other countries is envisioned to bolster the growth of optical coherence tomography market. Additionally, considerable increase in the occurrence of cardiovascular and ophthalmologic disorders is also predicted to foster the growth of optical coherence tomography market. Moreover, rapidly growing geriatric population is also predicted to augment the demand for highly advanced devices for diagnosis purposes which is also fostering the growth of optical coherence tomography market. However, high cost of optical coherence tomography is expected to hinder the growth of optical coherence tomography market during the forecast period.